This year's workshops are all about giving you the tools you need to help you find solutions to issues you currently face. We've programmed three full-day workshops and six half-day workshops. Workshop facilitators are recognized experts in their field and have stellar reputations as workshop leaders. Please select the workshop that best meets your needs. Priority will be given to individuals who register for the full conference. A higher fee will be charged for individuals only attending workshops. As space is limited, we would encourage you to register as soon as possible. All events will be held at the Toronto Hilton Hotel unless otherwise noted. Ideate, prototype, repeat to produce and refine the approach. In the morning, participants will collaborate in exercises that demonstrate how these approaches can be used to quickly consider visitor types and experience, define the problem, generate and share many ideas, then narrow down to shared strategies and solutions. In the afternoon, teams of participants will apply the three key learnings from the morning to conceive and prototype innovative makeovers to several existing ROM displays. Attendees will leave with concrete and low-cost tools that can be used in museums of all sizes to develop exhibitions that foster innovation, efficiency and both team and visitor engagement. This workshop is for anyone working in exhibition development who is interested in the practical techniques used by many kinds of user-centred creative industries. About your facilitators: From the award-winning exhibition staff at the Royal Ontario Museum, Dave Hollands has 38 years of experience in developing exhibitions and working in diverse teams. He is a founding member of the ROM Inclusion and Diversity initiatives now entering their 15th year. Steven Laurie brings to the table eight years of project management experience and a unique vision as a practicing contemporary artist when working with exhibition teams and projects. Courtney Murfin and Emilio Genovese have been applying design thinking principles to exhibition design since they piloted a dedicated prototyping space at the Museum four years ago. They are devoted to encouraging and experimenting with innovative practices in the service of visitor-centred experiences and more collaborative working teams. Fee: $150. Includes transportation to and from the ROM, two networking breaks, lunch and digital session notes. Limited to 25 participants. 2. Strategic Planning and Community Engagement: You Can’t Have One Without the Other! Focused on the combination of internal stakeholder alignment and external stakeholder engagement, this workshop reviews best practices in strategic planning and community engagement. It highlights the overall process of how best to assess the success of existing programmatic models in meeting the market needs of the community while determining barriers to participation. The workshop covers the core of SWOT analysis, thematic trends and the role of the strategic planning committee and community advisory task force. It covers how best to create a public discussion about the value of the museum to the community while testing its future initiatives in the context of demographic shifts. The workshop highlights how best to gather information from attendees and non-attendees to determine perceptions and needs. It culminates with how best to develop a clearly conceived, well-organized strategic plan that addresses the market-driven needs of the community with specific, measurable, attainable, reviewable and time-sensitive (SMART) goals and objectives. Participants will leave with a deeper understanding of how best to align both intellectual commitment and emotional engagement in supporting the mission, vision and value of the museum and its programs. About your facilitator: Dr. Bruce D. Thibodeau, President of Arts Consulting Group, has over 30 years of experience in guiding leadership transitions, enhancing contributed and earned revenues and building organizational sustainability through robust strategic planning, community engagement and facilities & program planning processes. He has facilitated numerous interactive workshops throughout the arts and culture sector focused on strengthening the board’s capacity to play an active role in governance. Dr. Thibodeau has also conducted extensive research on how stakeholders influence and are influenced by the activities and practices of nonprofit arts and culture organizations. A regular guest speaker at various national and international arts, culture and academic conferences, Dr. Thibodeau’s recent conference papers and presentations include the Academy of Management; Social Theory, Politics and the Arts; International Journal of Arts Management and The Journal of Arts Management, Law and Society. Fee: $195. Includes two networking breaks, lunch and printed material. Limited to 25 participants. Cultural tourism is one of the fastest-growing global tourism markets. Culture and creative industries are increasingly being used to promote destinations and enhance both their competitiveness and attractiveness. Many locations are now actively developing their tangible and intangible cultural assets as a means of developing comparative advantages in an increasingly competitive tourism marketplace and to create local distinctiveness. This full-day workshop will begin with a morning panel discussing the growing relationship between tourism and culture, with representatives from multiple perspectives discussing ways in which we can work together to become major drivers for destination development and become more attractive to visitors and more successful as a result. Workshop participants will engage in breakout discussions and facilitated conversations to identify the best practices across the sector. The afternoon will focus on the nuts and bolts of “how to partner” with a focus on what it takes to create and implement effective partnerships. Participants will complete self-assessments to determine how prepared, willing and able they are to partner. Discussions will identify the key ingredients to successful partnerships. The workshop will close with a second panel discussion illuminating case studies of successful partnership initiatives. Participants will learn to build relationships between cultural centres, museums and the regional tourism bodies to support shared objectives and leverage resources (specifically the financial benefits, including access to different funding streams). About your facilitators: Kathleen Brown, COO of Lord Cultural Resources, provides 30-plus years of experience as a respected consultant with proven management skills. Her workshops are interactive, informative and leave clients and other participants inspired and informed for their organizations’ future. Erika Stenson has a depth of experience in providing vision and leadership in organizational development, communications, global marketing, operations, government relations and business development in the private and public sectors. She is an alumna of Harvard Business School, a communications and advertising accredited professional and has a diploma in applied communications. Fee: $150. Includes two networking breaks, lunch and printed material. Limited to 40 participants. Digital games offer engaging ways to learn about museum collections and content through interactive and immersive experiences that are otherwise difficult to simulate in physical form. This hands-on interactive workshop explores how museums can capitalize on game design practices to create fun and participatory game-based exhibits and programs for onsite and online visitors. The presenters will share a 30-minute overview of digital game-based initiatives at the Royal Ontario Museum and the game development process, followed by a 2-hour prototyping activity and a 30-minute playtesting session. Participants will gain firsthand experience in design thinking and interactive design strategies by collaborating in small teams to create playable game prototypes. By the end of the workshop, participants will better understand how games can produce meaningful learning experiences in museums and how the iterative design process can build more collaboration and agility into their organizations. About the ROM Makerspace: The ROM Makerspace is a digitally-enhanced creative learning studio with a mission to support students and educators in building connections to the museum’s collection through traditional and digital making activities. The ROM Makerspace is a multi-use room that primarily offers interactive, hands-on experiences for Grades K–12 school groups. About your facilitators: Digital Learning Specialist at the Royal Ontario Museum, Sarah Chu has 13 years of research, development and instructional experience in the learning technology field. She has designed and developed games for learning and social impact, studied players' literacy practices in games and taught university courses on learning and technology. She has published peer-reviewed articles on games and learning in books and journals including Exhibition, Games for Health Journal, International Journal of Learning and Media and User Experience. She currently oversees the on-site digital learning and online distance learning programs at the ROM. Sarah Elliott, Digital Content Producer at the Royal Ontario Museum, builds on 17 years of hands-on teaching experience in museum galleries and labs and understands that engagement and interactivity are key to digital learning. Her passion for technology has encouraged her to investigate the ways that digital tools can create bridges to connect diverse audiences to museum learning. Her most recent work includes a pilot program to build and operate a rich Minecraft world as a platform for Virtual Visits, using interactive storytelling to discuss themes of responsible mining, community, cultural respect and the cascading impacts of individual actions. Fee: $75. Includes transportation and a copy of the slides delivered electronically at the end of the Workshop. Please bring your laptop. Limited to 20 participants. Canadian museums know that strong standards and guidelines are essential for managing and using museum collections and rationalizing the use of resources required. Museums of tomorrow must adopt recognized professional standards to initiate new approaches to the management and dynamic use of collections. Developed by the UK’s Collections Trust and used widely throughout the world, the Spectrum standard sets clear professional benchmarks and provides practical recommendations for the daily management of museum collections. To support the adoption of Spectrum by Canadian museums, CHIN and the Collections Trust have worked in partnership to create a French version of Spectrum 5.0. The bilingual version of Spectrum 5.0 is now available in Canada and is highly recommended for Canadian museums. This half-day introductory workshop is open to anyone involved in collections management, whether you are a board member, staff member or volunteer. About your facilitators: Kevin Gosling co-edited the most recent version of Spectrum, having joined Collections Trust as Chief Executive in 2015. He was previously the Britten–Pears Foundation’s Director of Communications for the award-winning centenary of the composer Benjamin Britten in 2013. Kevin has also worked for Lord Cultural Resources, the Museum of London and in St. Lucia and Norway. Madeleine Lafaille is a Heritage Information Analyst with the Canadian Heritage Information Network (CHIN). She has worked within the museum field for the past 30 years, specializing in museum collections documentation and management, especially for the creation and publishing of digital heritage content. Fee: $75. Includes networking break and printed material. Limited to 20 participants. Have you ever considered your own digital journey? Do you know your level of digital maturity? This workshop will engage participants in both questions, investigate who should participate in digital development and how strategic initiatives can be implemented to achieve your institution's overall vision. Participants will learn about frameworks, models and tools to understand their museum's digital maturity, to map visitor journeys — pre-visit, on-site and post-visit — and how to evaluate the digital visitor experience consistently. We will discuss how a museum can improve its understanding of the virtual and physical environments, the implications of identified digital touch points, digital best practice, centralization vs. devolution and framing and prioritizing digital strategies. You will learn about trends and best practices in incorporating digital into the visitor experience and better understand the ways in which digital technologies can increase relevancy, expand access and strengthen the quality of the visitor experience. About your facilitator: A leader in thinking and planning digitally, Sarah Hill is a Senior Consultant at Lord Cultural Resources. Sarah’s core competencies include visitor experience design, public engagement, program planning, strategic development, feasibility studies and business planning. With the rise of digital technologies, Sarah has taken an interest in helping museums to develop a new visitor experience that seamlessly transitions between physical and virtual. Fee: $75. Includes networking break and printed material. Participants may be asked to complete a short quiz and self-evaluation of their digital maturity as a preparatory exercise in advance of the workshop. Laptops are recommended so that you may reference your website during the workshop. Limited to 25 participants. Do your vision and mission statements feel stale and out-dated? Do you think they miss the mark and no longer represent your institution nor appeal to your visitors? Maybe they need a significant overhaul? A refresh? Or just an alternative way to think about them and implement them in your institution? Creating and developing a visitor-centric vision and mission takes the strategic purpose of the institution beyond traditional products and services, to focus squarely on the visitor, in meeting and exceeding their wants, needs, expectations and perceptions. What do we mean by strategic visioning? Why does our institution exist? Who do we exist for? What is our purpose, both short-term and long-term? What is our distinct point of difference? How do we remain viable and sustainable? The first half of the workshop will be in a presentation/discussion format providing a brief historical overview of institutional visioning and planning followed by a review of current museological theories and best practices, ending with the introduction of a new visioning model that practitioners can implement in their institutions. During the second half participants will have an opportunity to put the concepts and ideas into practice. About your facilitator: For almost 25 years, Brian McAlonie has utilized his broad range of expertise in the communications, design and museum fields to assist clients with creating engaging and profitable visitor service experiences. Combining an M.A. in museum studies from the University of Leicester, England with his vast professional experience, Brian assists cultural institutions and heritage organizations with creating and implementing master visitor experience plans, museum exhibitions, interpretive plans and museum stores to build sustainable audiences and revenues. Specifically, Brian is responsible for board and staff visioning facilitation, strategic planning, creative strategy development, interpretive planning, brainstorming and client communications. Brian speaks regularly to various national and international museum professionals. Fee: $75. Includes networking break and printed material. Limited to 25 participants. Linked Open Data is gaining prominence in the cultural heritage community and has a huge impact on the way resources are discovered and accessed on the Web. Museums need to adapt by changing the way information on their collection is made available, whether the data is published on their own website or through data aggregation, like CHIN’s Artefacts Canada website. This introduction level workshop will focus on the basic concepts of what Linked Open Data is, why to use it, the strategies to be implemented and the transformations to be considered, from policies to internal processes, in order to correctly position our content. It will help attendees understand the benefits of creating long-term value in your data and the risks of not adapting to the evolution of the Web. About your facilitators: Madeleine Lafaille is a Heritage Information Analyst with the Canadian Heritage Information Network (CHIN). She has worked within the museum field for the past 30 years, specializing in museum collections documentation and management, especially for the creation and publishing of digital heritage content. Josée Plamondon is a librarian specializing in databases and a consultant specializing in open and related data and interoperability issues. Member of the Digital Council and the Advisory Committee of the Massive Data Center for Culture (Quebec), she has a Master's degree in Information Science and an MBA. Fee: FREE! Only open to conference registrants! Includes networking break and printed material. Limited to 25 participants. What does branding have to do with museums and why should they even care? This half-day workshop will focus on taking cultural institutions and heritage organizations beyond the traditional approach of branding products and services (exhibits, programs, special events, etc.) by introducing the concept of branding museum visitor experiences. The first part will be conducted as a presentation/discussion while the second part will give participants a chance to put the concepts and ideas discussed into practice. Participants will return to their institutions with a set of concrete ideas and concepts you can implement immediately. A short historical perspective of branding — key in understanding the concept of branding and where it originated. Branding: Why should museums care? Contemporary branding concepts, approaches and practices. Branding the museum visitor experience. About your facilitators: For almost 25 years, Brian McAlonie has utilized his broad range of expertise in the communications, design and museum fields to assist clients with creating engaging and profitable visitor service experiences. Combining an M.A. in museum studies from the University of Leicester, England with his vast professional experience, Brian assists cultural institutions and heritage organizations with creating and implementing master visitor experience plans, museum exhibitions, interpretive plans and museum stores to build sustainable audiences and revenues. Specifically, Brian is responsible for board and staff visioning facilitation, strategic planning, creative strategy development, interpretive planning, brainstorming and client communications. Brian speaks regularly to various national and international museum professionals. Fee: $75. Includes networking break and printed material. Limited to 30 participants. Accessibility is a critical issue that all institutions are currently addressing. This half-day workshop presents unique examples of how museum professionals and designers can prioritize inclusion in the creation of accessible exhibits and programs within your institution. This interactive workshop will provide attendees the opportunity to learn about current accessible exhibit design best practices and progressive inclusive strategies. Participate in an interactive exercise to brainstorm practical solutions to complex access issues. About your facilitators: Christian Blake is the Inclusion Manager at the Royal Ontario Museum and a registered Occupational Therapist. He applies extensive experience and a unique lens to promoting participation and engagement across the ROM’s inclusion, diversity, equity and access portfolio. Carolyn Holland, an Exhibition Interpretation Officer at Ingenium, was part of the exhibitions team charged with CSTM’s renewal project, which saw the entire building transformed from its contents to the container itself. Carolyn has previously worked at both the Canada Agriculture and Food Museum and the Canada Aviation and Space Museum. Pauline Dolovich is a Principal/Senior Exhibit Designer at Reich+Petch, Architect and LEED Green Associate. She specializes in working on large-scale museum projects that involve multi-disciplinary teams of specialists and object-rich and complex installations. Carolyn Smith is an Associate/Senior Exhibit Designer at Reich+Petch, Architect and a LEED Accredited Professional. She has a deep understanding of different types of visitor attractions including museums, science centres, education centres and zoos. Kim Fullerton is the Director of Akimbo Art Promotions and co-founder of Access Visual Art. She co-chairs ArtsBuild Ontario’s access committee and sits on the Board of Tangled Art + Disability. Fee: $75. Includes networking break and printed material. Limited to 40 participants. Since the '90s, the Canadian Conservation Institute (CCI) has been promoting flexible and sustainable climate specifications. In 1999 the "engineer's bible" - the ASHRAE handbook was published. Robert Janes cited this as an example of the "mindfulness" that the museum community should embrace. CCI has coordinated substantial revisions for the 2019 edition of ASHRAE, emphasizing sustainability, local climate and on recognizing what each collection requires. The CCI web pages are being revamped. New advice on LED lamps is available. CCI has begun to collect energy use data from museums and to develop tools to identify where utility savings can be made. Join our panelists as they explore not only the practical implications for sustainable facilities management, but what we should be communicating to our staff, boards and to our visitors. The opening reception officially marks the launch of the CMA 2019 exhibit hall. Join your colleagues and valued exhibitors as you discover the latest products and services that will help you work more efficiently and effectively! Once again, CMA will be providing a conference app to ensure participants are up-to-date on all the news on the conference, able to contact their fellow delegates and exhibitors and to provide an opportunity to win fabulous prizes provided by the exhibitors. Details will be provided to delegates prior to conference. Fee: FREE! This is included in your basic and all-inclusive registration fee! Additional tickets may be purchased for guests at a cost of $40. Includes light refreshments and one glass of wine followed by a cash bar. Pre-registration is required for all evening events. Tickets will not be sold onsite. 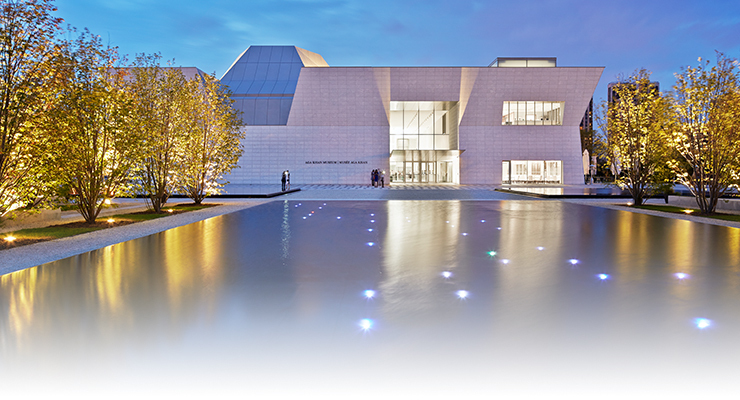 Explore the Aga Khan Museum, North America’s first museum dedicated to the arts of Muslim civilizations, presenting objects from Spain, across North Africa, the Middle East, China and more. With world-class performing artists and a vibrant temporary exhibition program, the Museum aims to connect cultures through art, promoting pluralism and fostering a greater understanding of how Muslim civilizations have contributed to world heritage. Enjoy time with your colleagues amidst 19th century hand-painted panels from Damascus in the Diwan Restaurant. Tour this award-winning building inspired by light, explore our permanent collection and our newest exhibition Mirror of Time: The Moon in Islamic Art and Culture. Enjoy performances of music and dance, get hands-on with our pop-up learning stations and art activities in the Education Centre. Fee: $95. This is included in your all-inclusive registration fee! Open to delegates and guests. Fee includes transportation, gallery access, special programming, buffet dinner and one glass of wine followed by a cash bar.